Bleeding Teeth belong to the Nerite Family of shells. They are gastropods. Bleeding Teeth are considered a large shell among the Nerite family. They are thick, short spired shells. The Bleeding Teeth shell surface usually has slightly raised spiral ridges. 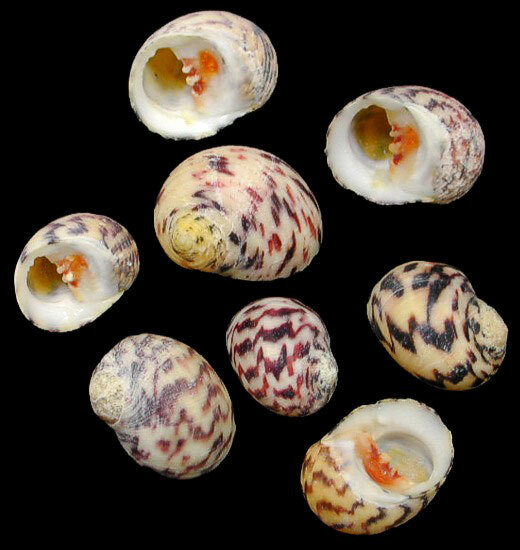 The dark red operculum is granulated on its inside. The color is usually yellow reddish or creamy with darker streaks or zigzags. Scientific name: Nerite peloronta. Habitat: Likes to hide under near shore rocks, ranging across the Caribbean; which includes the Gulf of Mexico and Eastern facing shores of South America to the Northern fringes of Argentina. They are named after their orangish stained square-like teeth.